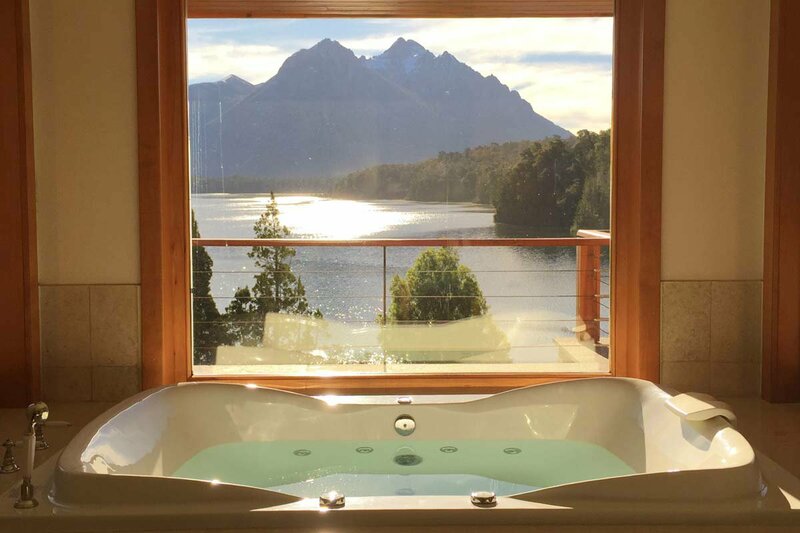 The tub and the view at Llao Llao Hotel in Bariloche, Argentina. All photos by Nora Walsh. What could be better than a tango in Buenos Aires and a walk in the Andes Mountains? A long soak in the right bathtub in the right hotel. Mendoza-based writer Nora Walsh skips the obvious in favor of the indulgent. ARGENTINA – I consider myself an environmentally responsible person. Until it comes to filling a bathtub. Especially the deep-soaking kind. Although, because I can argue that the wellness benefits of a bath make me a more relaxed, healthy person who can contribute a greater amount of positive energy to the world, perhaps it all balances out. I'm a ritual bather who loves piping hot baths brimming with mineral salts and essential oils. Throw in scented candles and easy-on-the-ears music, and you'll know where to find me for the next few hours. As I've gotten older, my travel habits have changed. I was once a wide-eyed globetrotting neophyte who explored a destination until I literally collapsed from exhaustion. In my early twenties, consuming half a bottle of Cuban rum and dancing until dawn was my idea of a good night. Now, in my early thirties, a hot bath with lavender salts and eucalyptus oil is a dream come true. I traded go-go-go for breathe-breathe-breathe. Which brings me to a recent trip to Argentina. 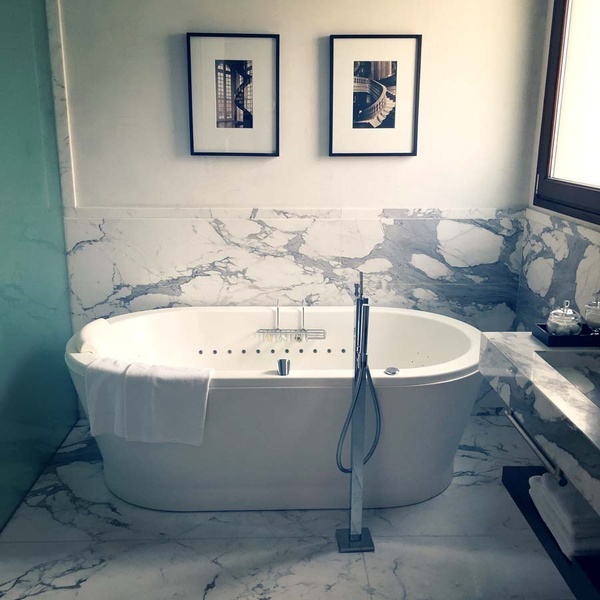 I checked into my room at the ten-suite Buenos Aires boutique hotel and went weak at the knees when I saw the bathroom. Hello, Saturday night. I'll be attending the party for one in the free-standing tub in the middle of the marble expanse. I would do it right. The bath oils on the menu (yes, the menu) included lavender and anise, Algodon fruit orchard, olive oil and rosemary oasis, and purifying and energy cleansing desert sage bath. I asked my butler (yes, my butler) to procure a dropper of essential oils from the spa before it closed. I tested the mood-light settings located on the power panel. I spent hours in that blissful water cocoon. I watched the sunrise and the sunset. I stole off for midday soaks instead of nature hikes. I couldn't get enough. I called housekeeping for extra lavender salts before I got in (that tub is big). I adjusted the moveable headrest to shield my eyes from direct sunlight. I mastered a bath-filling technique (start lukewarm, then switch to hot because water rises from the bottom, pushing cold water through the drain at the top). Yes, that much time in the tub. No guilt, though: The views ensured I never felt like I was missing out on Bariloche. I don't usually pilfer bathroom amenities, but I did help myself to a few sets of bath salts and body wash. When I use them at home, I'm transported right back to my Llao Llao utopia. And all is right in my world. 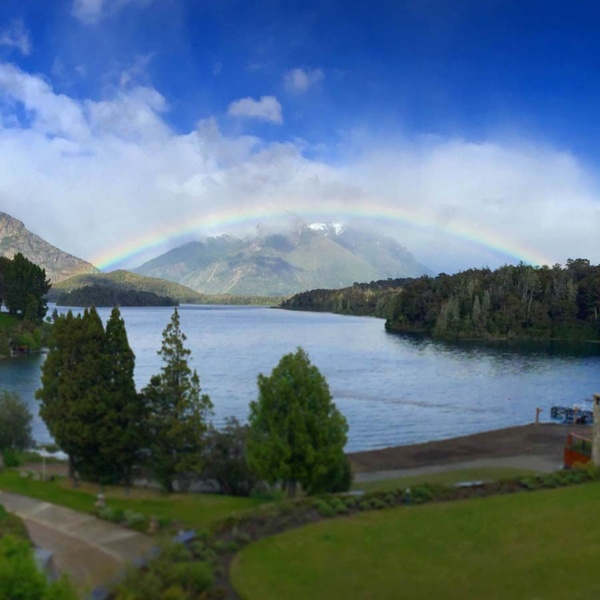 Almost too good to be true: a rainbow at Llao Llao. У нашей компании авторитетный сайт с информацией про h-school.kiev.ua. Nora is a perennial traveler, writer, and founder of the travel blog . You can follow her on and . She travels to feel alive and to connect with locals who become lifelong friends.